For a snowy mountain adventure in Solden, Austria in Spectre, James Bond wears an elegant outfit of a nylon-front blouson, a mock turtleneck and vintage-inspired ski trousers. The zip-front blouson from Tom Ford is knitted with a fine rib in dark grey merino wool with elasticised cuffs and a mock turtleneck collar. The front of the blouson, however, is blue nylon with 12 large, down-filled ribs. There is a zipped slash pocket on either side of the front. This blouson is a copy of the types of blousons that the French brand Moncler makes. Under the blouson, Bond wears a mock turtleneck jumper from N.Peal in “Lapis Blue”. It is made from a fine gauge 70% cashmere and 30% silk blend. The collar, cuffs and hem are knitted in a fine rib. The warm, rich blue is flattering to Daniel Craig’s warm complexion, and the bit of blue that shows from beneath the blouson’s collar brings the needed contrast to the dark shades of the rest of the outfit. The warm colour of the jumper is more like cerulean than a true lapis blue. Those were based off French army ski trousers, 1960s ski trousers. I took them to Tom Ford, and he made them for us. It was very old fashioned the way he did it, with the same look. 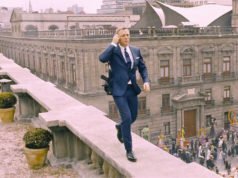 Since they are based on 1960s trousers, the “Sky Pant” does not have the slim fit of all the other trousers than Bond wears in Spectre. They are tailored from a heavy brushed wool, woven in a pronounced steep twill. At the front there are double forward pleats. The pleats are stitched down roughly two inches at the top about half a centimetre into the pleat. It’s not uncommon for pleats to be stitched down for the first inch or two at the top to help them lay more neatly, but they’re ordinarily stitched down at the edge of the pleat. By stitching down the pleat away from the edge, the sharp edge of the pleat is continued up to the waistband for a less interrupted look whilst still benefitting from being stitched at the top. On each side of the trousers forward of the side seams is an offset side pocket with rearward-facing flaps that fasten down with a button. There is a a jetted pocket on either side of the rear. The legs are tapered and have stirrups and expanding gussets at the bottom. The trousers have belt loops, but we don’t see if Bond wears a belt with them. Though the trousers are designed for skiing, James Bond does not ski in Spectre. These may be very stylish, but there are better modern alternatives for actual skiing. If they get wet, the elegant crease down each leg would disappear! Bond wears the trousers tucked into black Danner Mountain Light II 5″ boots. The boots lace with five pairs of lugs to the toe and two pairs of speed hooks at the top for a secure fit. The boots are made of one piece with leather plus a counter up the back. They have Vibram rubber soles with yellow cleats. Bond wears heavy grey socks folded over the top, meaning the trousers are worn inside the socks as well. Bond’s sunglasses are from Vuarnet with black leather shields on the sides. The quilted black gloves are made by Agnelle. I think you are correct Matt in that are better modern alternatives that would function better. I think this outfit looks good but it serves no practical purpose in the outdoor setting in which it is worn. The photos of Craig wearing a big Canada Goose jacket over this outfit between takes says a lot. I remember at the time this sparked rumours that he was wearing Canada Goose in the film. Overall, this outfit just seems odd to me. I’m definitely not a fan of the jacket. I think this sequence would have been a great opportunity to create a new costume that paid homage to Bond’s classic anorak from OHMSS. As with so many things in Spectre, this seems like a missed opportunity and ultimately a misfire. Excellent post again Matt. Will you be doing a write-up on the outfit he wears for the finale? The jacket in particular looks like a good topic for you to dig into. 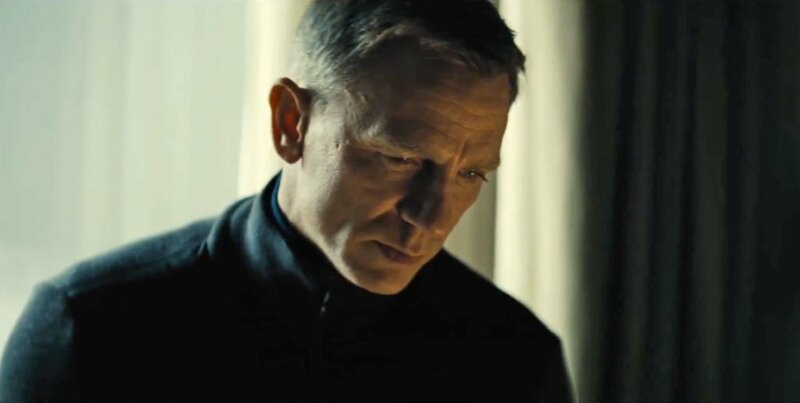 I will be writing about all of the clothes in Spectre in great detail. I’ve never seen a pair of sunglasses on Daniel Craig’s face that seem to suit him. They’re appear either too small (Quantum of Solace) or just ridiculous (these above from Spectre). It’s not his fault, I guess he wears what he’s told to wear! I’m not letting that get in the way of my enjoyment of the film though. I really liked it. 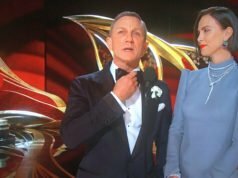 Glad we didn’t get Skyfall 2 with plot holes galore. I’m amazed some people don’t like it. Bond clothes aside, can you sum up your opinion of the film in one sentence, Matt? I enjoyed it more than any Bond film since Dalton, but I thought it would have been better without tying everything from Craig’s past Bond films together and making it so personal. Those elements of the story felt too forced. I don’t think these shades were meant to be stylish, rather they were meant to show that Bond was clever enough to have some special and expensive snow goggles. 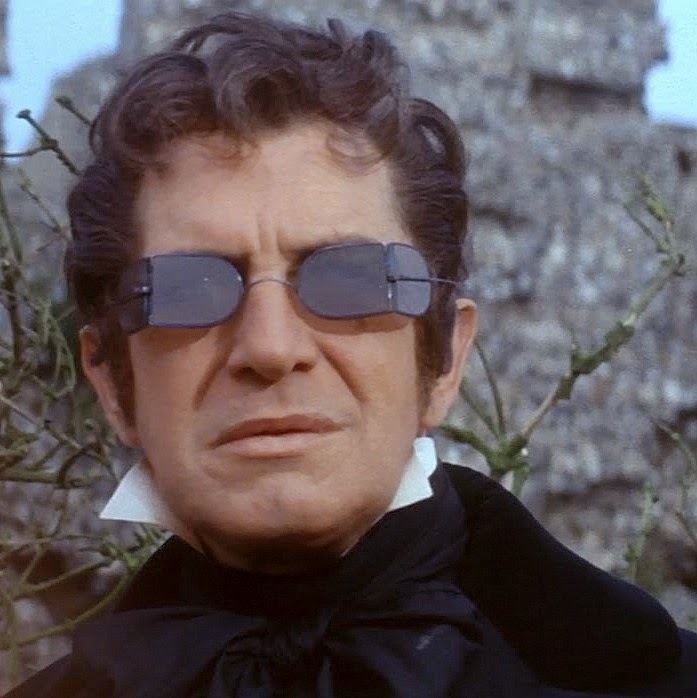 They’re only in the film for a handful of frames anyway, so it did look a bit strange that he put them on at all. I’m pleased you liked it, especially with your Dalton comment as he was my way in to the series, too. Populist belief, be damned, The Living Daylights is the perfect Bond film. Trying to please book fans, outré Bond film fans and moody Quantum lovers, it gave us a bit of everything and Spectre also rode that line well. Are those trousers actually available to purchase from Tom Ford or were they made exclusively for the film? They were made first for the film but are now available from Tom Ford if there are any left. Actually, this pair of trousers might be reference to the “Vorlage” ski trousers mentioned by Fleming in OHMSS, if I remember correctly. -I agree to your statement on TLD – I also enjoyed it very much. Although from a sartorial point of view not outstanding the film itself is IMO one of the best ever. Some people have suggested that Bond should have worn an outfit that was more of tribute to other films with snow scenes. But this outfit is modern but classic, the wool sleeved blouson with the nylon down front is a popular style of jacket at the moment. It keeps Bond warm but also mobile and not bundled. A lot of the outfits in the Craig films in cold weather are lightweight, even though he may not be as warm then if he wore more layers or a heavier jacket.